Did you know that average person in the United States eats about 3500 mg of sodium per day, which is two times more than the recommended dose of 1500 mg? According to the American Heart Association, we consume more salt than it is necessary which can lead to heart disease and high blood pressure. Taking care of your health is essential. And having a healthful eating plan is one of the most important steps toward a better and healthier life. Making a good diet program and consuming low sodium foods can make a big difference. If you are very busy and don’t have time to make your own meal program, shop and prepare your food, you can check out the home bistro.com as it is one of the best meal delivery services. They have fantastic eating plans for every individual that wants to eat more nutritious food. The best part is that these deliciously prepared meals will be delivered to your door. This company is committed to provide the best possible dietary programs for you and your family, no matter if you are looking for a healthy dishes that will maintain your good health and weight or if you are interested in incredible gourmet cuisine. All you have to do is choose what is best for you and what suits your needs, and they will do the rest. Or if you love to cook, you can always make a great diet program by yourself. And don’t immediately assume that meals without salt cannot be as tasty as with it. In fact, less sodium means more delicious dishes. So, we need to ask you this – isn’t it time you cut back? If you answer is yes, then you should use our low salt recipes to serve a low-salt, tasty meal. First, you need to season the meat. In a flameproof dish heat 2 tablespoons of oil and place the chicken in it until golden brown on all sides. Place the meat on a plate after it is done. Whizz garlic, ginger, tomatoes and chopped onion into a paste. In the remaining oil fry the sliced onion until softened. The next ingredients you should add are spices. Fry for one minute more. After you have added the pasta to this, you need to cook for another couple of minutes to soften. Place the meat in the dish again with the vinegar, sugar, stock, and squash. When starts to simmer, you need to cook it for thirty minutes until the meat is done. Hold the chicken out and stir in the cherries. Shred the meat into small-sized chunks while simmering the sauce to thicken. Stir the poultry back into this sauce. Don’t forget to season it. The final step is to combine the feta, mint, lemon zest and red onion. Place this mixture over the dish and serve with yogurt and couscous. First things first, you need to preheat the oven at 400 degrees F. The next step is to sprinkle the fish with pepper, salt, and 2 tsp. olive oil. In a medium bowl stir the pepper, salt, thyme, oregano, lemon juice, 2 tbsp. olive oil, shallots, and tomatoes to blend. Place a fillet on a sheet of foil, oiled side down. Wrap the foil’s ends to create a spiral shape. Place the mixture of tomato over the fish. 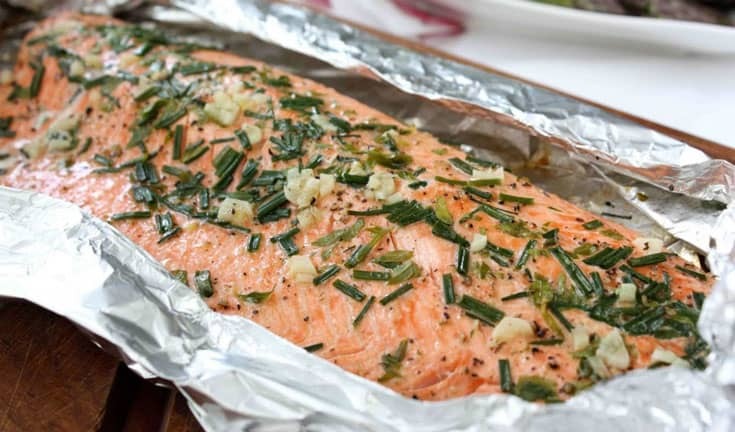 Over this mixture and salmon, fold the foil’s sides to cover entirely and seal closed. Place the packet of foil on a large baking sheet. Cook the salmon until it is baked through, for about 25 min. Transfer these packets to the plates using a large metal spatula. Serve immediately. In a medium bowl place the chicken. Mix in grinding of black pepper, chili powder, paprika and lime juice. Leave that to marinate for about 20 to 25 minutes. In a large non-stick sauté pan or wok, heat 1 tablespoon of oil. Tip in cumin seeds, whole chili, cardamom pods, and cinnamon sticks and fry slowly just to release their fragrance and color. Stir in ginger, garlic, and onion and cook over a medium to high heat until the onion starts to brown, for 3 to 4 minutes. After you have added the remaining oil, place the chicken and stir until no longer looks raw, for about 3 minutes. Mix the garam masala, ground coriander, cumin, and turmeric. Lower the heat to medium, tip this into the pan and cook for about two min. Pour in 150 ml water and passata, and place in the chunks of pepper. Again lower the heat when starts to bubble and simmer until the meat is tender, for about 20 minutes or less. The next thing you need to do is stir in the tomato and simmer for about 3 minutes. Add spinach and wilt while turning it over in the pan. Use just a little bit of salt to season this dish. If you prefer, you can add some water to the sauce to thin it down. Remove the cardamom pods, chili, and cinnamon sticks before you serve the meal. That also depends on your personal preferences. You can use fresh coriander to scatter it and serve with basmati rice or chapatis if you want to. But we recommend to try it this way. It is delicious and low-sodium food that will suit anyone’s taste. Although it may sound impossible, you can make some delicious food without touching a grain of salt. Our health authorities have been warning all Americans to slash the sodium in their diets. But, don’t worry you don’t have to remove it forever from your daily meals. In this article, you can find our favorite low-sodium meals that taste fantastic without boosting blood pressure.